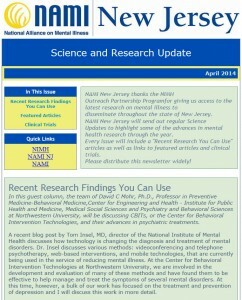 NAMI New Jersey’s quarterly Science Update features the latest developments in research and treatment. As the New Jersey NIMH Outreach Partner Program, NAMI NJ receives ongoing access to current, cutting edge science and treatment news and is committed to disseminating this information statewide for the benefit of families and individuals. Every issue will include a “Recent Research You Can Use” articles submitted by our NIMH Outreach Partnership Research Advisor as well as other scientists and providers, with links to featured articles and clinical trials. If you would like to receive the Science and Research Update on a regular basis please sign up here.